When I think of Open Source I think of people freely contributing for the greater good. Unfortunately, that glorious purpose can be co-opted by big business for their own ends. Given their history of always trying to get the most work out of people for the least compensation – which is one of many reasons why the world economy is crashing – would you be surprised that for-profit businesses would love to have the fruits of the labor of masses of intelligent, generous and good-hearted without having to pay a penny? Since my answer would not fit in even dozens of tweets it inspired this post. Zach refers to this post by founding developer of WordPress Matt Mullenweg that states that WordPress IS Open Source. I’ll start answering that question by mentioning that FireFox is or was or is supposed to be Open Source, but what kind of Open Source is FireFox? illusions painted for our benefit. If Mozilla tried to recruit developers by telling them they should donate their time so that Mozilla could make money from their work, how many volunteers would they be likely to attract? If, on the other hand, they tell us that “The Mozilla Foundation is a non-profit organization that promotes openness, innovation and participation on the Internet” how many will jump in to create great solutions? Who really founded Mozilla or Automattic? Who controls FireFox and WordPress now and what are their goals? To be the best browser or to better track our actions? Capitalism (those who work the hardest theoretically will enjoy the fruits of their labor). Unfortunately, these all fail short for the same reason. The reality of them – through corruption – prevents the ideal from being realized. All we have is the ILLUSION of the ideals. The way we have an Illusion of Democracy. We have to consider the probability that the goals of all the contributors to what WordPress has become – the best CMS (content management sysmte) for blogging and many other purposes – may eventually be co-opted by the goals of those who control Automattic. most prolific and intelligent commentators across blogs? Comments – especially when CommentLuv is in use – are how we quickly build communities of like-minded thinkers and strengthen relationships and collaborations with each other. If it were not for Phil Hollows, developer of FeedBurner alternative FeedBlitz and Andy Baily, creator of CommentLuv – an alternative to the Automattic offering Intense Debate commenting system, Akismet would be still be used instead the GrowMap anti-spambot plugin – our Akismet alternative. Akismet silences free speech and the most articulate of writeres by burying their best comments in a sea of spam – spambot generated garbage containing objectionable adult content and from bad neighborhoods that Akismet COULD easily block IF they so chose. best and most active commentators. Automattic COULD fix this by giving many advanced bloggers the ability to moderate which sites are flagged as spammers. But they don’t. If Automattic had the heart of the many contributors and users of WordPress, would they have made comments default to nofollow? Would that have been the decision that is best for the greater good? those with the most to share to create a better world? Or is that goal aligned with Google’s plan to favor big brands – as their CEO publicly announced in his infamous “Internet cesspool” comment? Google is systematically updating their search results towards that goal with the MayDay Update and the Farmer Panda Update being the most obvious examples. individual rights to freedom, choice and equal access. Google’s monopoly combined with attacks on Net Neutrality which is, as @DykesonaDyme said, “THE #freespeech issue of our generation”. Read Timothy Karr’s (@TimKarr) post on The Huffington Post about BART turning off cell phones in San Francisco. It amazes me somewhat that so many otherwise intelligent people seem oblivious to the fact that search engines including Google censor results – and can easily determine what you see and what simply disappears! How many truly understand what net neutrality means to free speech? Do YOU know why net neutrality matters? The Global Plutocracy is terrified of dissent – and that means they would love to eliminate our ability to communicate freely. Do you read futurists like Esther Dyson on the long term effects of focusing on using solutions like Groupon can erode merchant prices or consider how unwise chasing low prices at the expense of sustainability truly is? about these complicated issues of our times. This is a really great post! Good ideas are always taken over by those with money and therefore power. Even congress started out as a good idea! Open Source, Creative Commons, Free Software, Shareware if you are a developer it is SO important to understand what license you are releasing your product under and what ramifications there are once its been released. We are at an interesting turning point in history where the internet (and its freedom) is in the hands of a few large companies and now governments are playing catch up to try and dilute the influence of the mega companies. Whilst at the same time governments want to be able to retain the collective statistics and knowledge accumulated by the mega corporations. Open Source…. difficult to understand today, but is great for those who work only in this sector .. What will be in future? Open source applications have grown to be the favorite target of the big companies. This is perfectly understandable. A lot of bright people contribute to making the open source app better so it’s more likely that their apps are better than what small, medium, or even the big companies have. And since it’s open source, it’s cheaper. This is how the game is being played today. And I think this will be the trend. I definitely on it. Most people look ways to gain more profits that contribute to do a task in illusion. We don’t mind it that illusion will go the flow that enables us to feel the beat of it. All we want is to secure our love one’s to survive and to stand their own feet. It’s not just big businesses that love to get their hands on Open Source products. Here’s an example: While in grad school, I was using an Open Source drafting software package to complete my assignments. After I graduated, I was hired by a small engineering company that was using some really archaic drafting systems. I mentioned the Open Source product and low and behold, I was the ‘wonder boy’ at work which is great. However, I kept asking myself if they were paying outrageous salaries to ‘some’ of these engineers, then why couldn’t we invest in some state of the art PAID software that would be able to do a much better job for what we need? Just thought I would throw that one out there. The problem we all have is realizing how our decisions affect everyone else and our own lives over the long term. Most people only think of the bottom line in the short term and not how what they choose to buy – or not buy – affects the availability of what they may desire in the future. Did you try suggesting that? They might listen – or not. I’m sure you’re in a better position to know whether they would. great info about Open Source. your this post really gives me a good idea to write another post on this topic. i agree with most of your views in this post. trying to learn most of your techniques on blogging. keep on sharing and writing because i always wait for your post. It has to be pointed out that “open source” is not a panacea for the computer industry. Yes, the open source movement has contributed and improved computers immeasurably for all of us, but the fact remains that most successful open source projects are bankrolled by the same huge mega corporations we all like to demonize (IBM, Google, Sun, Canonical, HP, and so on). Open source and commercial software both need each other to survive and thrive – you can’t really have one without the other. Is true we don’t live in a perfect world, and for as long as people will be imperfect, we never will. But drawing a hard line and saying “all we have is the ILLUSION of ideals” is too harsh and unhealthy. True, democracy might not be perfect, but it’s the one that works best. As John Dalberg-Acton said “Power corrupts and absolute power corrupts absolutely”. Sure, this could be avoided in a utopian world, where humans are kind and always have good intentions, but that is not the case. Did you ever see the movie The Matrix? Anyone who believes we are living “the American Dream” is ignoring the major changes that have happened in my lifetime and the dangers that are already here. I assure you that I would love to think I was simply being pessimistic. Alas, I am being very REALISTIC and it really is worse – far worse – than is obvious. The middle class is pretty much already gone and America is already a police state. Most just don’t notice that because they drive around in little boxes that make them feel safe from the bigger box they live in to the even bigger box they work in. Even if they get stopped in between the two they don’t know how many others got stopped or what happened to them. Have you ever heard “when you have a hammer everything looks like a nail?” Well now if you are a cop everyone looks like a suspect. Where when I was younger if you were black you were immediately suspicious looking to white people – as @Chill_EB wrote in one of his songs he was “BORN suspicious”. Today EVERYONE is a suspect – even a 5’3″ 130 lb., white, unarmed, over 50 year old American-born woman. Instead of things getting better for minorities in this country they have gotten WORSE for EVERYONE. What is going on out there across America is insane. I have seen it first hand and you can read about it in my comment on ZDNet about my being threatened with arrest FOR WALKING in a business district. WALKING!!! One city near Dallas has trained a police dog to jump into your vehicle as soon as you roll down your window on a traffic stop. Talk about an illegal search! Roadblocks and car searches for who knows what reason are common on rural roads around Dallas. Being stopped for a “dim license plate light” or “not signaling early enough” are typical now. Corruption is rampant from all the totally INNOCENT people who were imprisoned in the Tulia Texas Drug busts to the phony evidence planted by corrupt cops used to deport hispanic Texans in the Dallas drug convictions. This kind of thing has been going on throughout history. The only thing that is different is that now the word spreads even when the major media covers it up so it FINALLY comes out. Anyone who thinks THEY are immune from what happened to those people in Tulia and Dallas and all the innocent people sitting in prison today is naive indeed. EVEN if you’re white. EVEN if you “know people”. If it is expedient for law enforcement, as Joan Baez has sung so poignantly for so long, “there but for fortune go you or I“. I like your argument, especially about Akismet (I’ve never activated it nor intend to – I’ll decide what spam is!) but I think your Open Source argument is a little misguided. Open Source can be for profit, and you can sell Open Source software (Red Hat, any of the Linux distro CD resellers) as long as the code is out there for people to inspect, study and modify. WordPress is Open Source – you can download the package, look and tinker with the files if you want, and you could even fork WordPress if you truly wanted the headache. My concern is not really so much about money, for profit or non-profit – it is about access and control. If WordPress decides they want to force Akismet on us and use it to silence the most intelligent commentators or at some point believes it is up to them to decide what you can or can’t write and censors what we do, what recourse will bloggers have? My point is that there may very well come a time when someone capable (or more likely many someones) will need to fork WordPress IF Automattic decides to censor our writing or our comments. This post is great food for thought. I love open source because it brings people together who are passionate for a common goal. They create competition for the for-profit companies, and inspire creativity. Our market place is better because of open source. The WP plugins for example are great, and are part of the reason WP has grown over the years. I don’t have a problem with the plugin creators asking for donations, nor giving them donations. But we all know, if you want to make a lot of money, don’t work for or start a non-profit. I also love for-profit businesses. They grow our economy, provide jobs that in turn give people a better standard of living, and can invest in technologies that can positively affect the whole society. There will always be greedy people (poor and rich), but let’s not forget that the people of the US willingly give a higher percentage of income to charities than any other country. That doesn’t sound like a greedy country to me. The number 2 country’s percentage is half as much as the US. The problem I have with businesses is when they get too big and have too much power. You mentioned Google. You can’t have a truly successful internet business of any kind without Google being a part of your success. It’s unfortunate, but true. Yahoo and Bing just don’t have the market share to overcome this. I wouldn’t have as much of problem with this if they remained a search engine company. But they are getting into everything, phones, computers, social media, etc. They see and collect tons of information and power. Our country has laws that are supposed to protect the citizens from companies using our information, but when you have a government that is interested in the controlling and collecting of information, then the enforcers of the law look the other way. This doesn’t happen overnight. We the people have given these companies our information, and have elected officials that don’t have our best interests in mind. We are reaping that which we have sown. I totally agree with you, as you can see by reading any of the posts in the Google category here. We have handed them a monopoly that can make or break any business or blog – but there ARE ways to maintain our freedom. I hope more bloggers will join in making sure we do. Did you notice in the Bloggers Wanted for Joint Ventures post that we’re looking for a blogger who is into model trains? If you have the time or know any other train bloggers we would love to hear from you. Even if you don’t have the time collaborating between your blog and that one would be highly beneficial to both blogs. As for wordpress I have noticed increasingly developers trying to figure out ways to protect their plugins and also to make money from their development. As it stands now most of them only ask for a donation and let me say that the plugins are top notch! I hope they figure out a way to get paid for all of their hard work. I also wonder how many actually donate for the plugins they use? Open source products have attraction for all users.Every user use that product without any distraction. 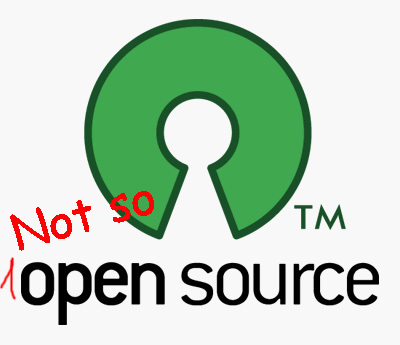 The world of “Open Source” has become very blurred lately. Many of the early advocates of this movement have moved closer to “for profit” models now. Well, the issued are really complicated and you ahve so much of everyhting in one small post I would say. Yes, we live in the world of illusions and they are all around us. Even our live is our own illusion. I think we just need to accpet it and live as it is as we can’t change the system in the world. The system will change us. Why are you chasing your tales???? Business is so misunderstood when it reflects on politics instead of ARBITRATION! Whatever the goal …arbitration is IT! We exist in the shared information age that encompasses contrast. Lucky us. We can invest, invent and commerce like none other. Let us be mindful that humans are about discoveries and that’s the REAL. Congratulations, you invent daily that changes the progress of distribution. Bon appetite. I think open source is not a natrual rule of humen society. But when competition getting heavier and heavier, and every contestent is pulling revenu plan behind the date when his competitions are failed, the world becomes an ‘open source’ place. Internet world, to be exact. So there’re two paths to succeed, 1 is like Steve Jobbs, the man with talent and originality, great marketing prediction and money to make it happen; another one is open sourced way. It’s a result of “casino capitalism”; our entire system has been bought and sold. Our lives are run by corporations, and their bottom lines. It sounds cliche or perhaps like mindless sloganeering to say, but its the truth and everyone should keep it in mind when watching the machinations of finance, politics, the entertainment industry, whatever. The interests of the corporations trump any other interest, including the health and well-being of our fellow humans, the advancement of arts and sciences, etc. It’s a disgusting plague upon humanity, honestly. An excellent answer and while I have never made public comments on government and politics prior to this point, I am well aware of the issues and am in agreement with you on the serious problems facing our privacy, net neutrality, on the general small business censorship by Google in favor of the oligarchical corporate interests. I also believe that anything we do is only a bandaid until we replace the US fiat monetary system that underpins the plutarchy’s ability to consolidate and maintain power. I would also venture to say the vast majority of WordPress.org users don’t know who owns and controls Automattic or how they influence or assert control over WordPress.org. I read all your posts and this post brings together many of the one-off topics quite nicely i.e. Google, Automattic, (Akismet and Gravatar), etc. I am very interested in discussing dramatic solutions to these problems in a way that doesn’t leave us looking like Don Quixote tilting at windmills. One issue that I think has potential to address is Gravatar.com. We are ripe for a do-not-track alternative. While GrowMap is definitely not a ‘political’ blog, it is impossible to be wise about business without understanding the big picture and the game we’re born into that – like the proverbial reference to playing solitaire with a “deck of 51” – is impossible to win. The Plutocracy or Oligarchy or whatever you want to call the Global Elite – I prefer ‘The Borg’ – have consolidated so much power over centuries and are so firmly in control of every country, every government, every major publicly-traded corporation that there is no non-violent means to depose them available to us today. Through their wealth they control the militaries and weapons of the world so even if you were not a pacifist as I am, overthrowing them with force is highly unlikely unless you had a team of elite Seals or similar who could subdue all the main players. Fools blinded by power and scientists with tunnel vision have already done so much damage that I do not believe there is any humanly possible way to reverse it so our time here is limited. See Science Trying to Play God is Destroying Us. While we ARE still here, I believe the better solution is to simply not play their game. Create local communities and do business only with them. That video is interesting but all over the place. I disagree with what he says about energy completely, agree with shutting down Monsanto – actually I would revoke the corporate charters of every evil corporations and let the chips fall where they may – better to just start over than try to reform evil – but most importantly we have to stop having as a goal unsustainable attainment of wealth and “stuff” for the sake of “stuff”. That is why con artists can scam people: they tell them what they want to believe – promise them the moon, setting them up for Ponzi schemes and the use of debt to steal what they have. If people would quit trying to grab the brass ring that the THINK is gold they would quit falling on their faces! All I desire is a simple life of freedom (which doesn’t exist in any country anywhere except through inner peace) with clean water and air, nutritious natural food, and reasonable shelter. Although that is unlikely to be achievable in the physical today, why I believe it will happen is explained at those other links and at the bottom of this post>> There is only one way that what I desire can be created. A very honest and different take on supposedly “open source” products! Unfortunately, I have to agree that it seems like big corporations always find a way to profit from labor of a few good hearted individuals who truly want to make a difference without having an eye on their own pockets. At the same time, I do understand in some cases why they go from a total non for profit to for profit. I mean, after all we all have to make a living one way or another. But, we could at least be honest and not call it an “open source”. That said, few can envision a world where each person contributed what they could and everyone had all they need without competing or capitalism or accumulating wealth, property or ‘things’. There is abundance enough for all but for those who crave ‘more’ constantly there is never enough and they want all they can hoard and don’t care who else has to starve – or even be killed – for them to have it. I know multi-millionaires who are accumulating wealth even though they have one foot in the grave who can’t bear to part with enough of their money to give their own grandchildren enough to eat. How anyone could value money for the sake of money over feeding their own families I still can’t really fathom – but I see it clearly.